Cancer research has established that tumorigenesis and tumor progression typically result from the accumulation of somatic genomic alterations over the life span. It is also likely that at least in some cases, somatic mutations cooperate with inherited germline variants that predispose certain individuals to have a higher risk of disease. At the same time, however, science has been unable to consistently identify specific somatic mutations that are conserved across all individuals who present with the same type of cancer. In luminal A breast cancer, for example, fewer than half of tumors have two or more somatic mutations that have been identified as being associated with the disease. Performing genome sequencing on tumors in tens of thousands cancer patients could provide the statistical power to produce additional actionable information, but this would come at an enormous cost. Moreover, identifying large numbers of mutations associated with disease does not necessarily make cancer more treatable, as differentiating between disease-associated and disease-driving alterations remains a challenge, and the time and financial costs of developing specific therapeutics targeted to each of those individual mutations would be astronomical. In the end, the polygenic nature of the problem will prevent us from identifying and characterizing all but the most recurrent alteration patterns, leaving most tumors untreatable. Work in our laboratory takes a different approach, which is predicated on a relatively simple and intuitive hypothesis that we call the bottleneck hypothesis. The bottleneck hypothesis holds that if different genetic events contribute to a relatively uniform disease phenotype, their effect must eventually converge to a single gene or a small number of genes within the context of the tumor-driving cellular network. In this way, even if individual tumors of a particular type exhibit variation at the genomic level, they should all exhibit aberrant activity in a common set of regulators, which are typically situated within highly connected regulatory modules that lie upstream of the programs that implement and maintain tumor cell homeostasis. In a similar way to what has been demonstrated with the targeting of aberrantly activated oncogenes, inhibiting these regulators should interrupt such programs and therefore eliminate the disease phenotype. Schematic representation of how cancer bottlenecks channel upstream genetic alterations to initiate cancer driving programs. We stress that tumor bottlenecks are not necessarily mutated genes, but constitute non-oncogenic dependencies that are essential to the implementation of disease-driving programs. The discovery of such bottlenecks in our lab has made it possible to identify not just regulatory modules within cancer-driving networks that are associated with tumor phenotypes, but also — because these modules are identified within a network context — to provide mechanistic details about exactly how disease is produced. Moreover, because master regulators are key nodes within networks of interacting genes and proteins that function as bottlenecks through which many different cellular functions must pass, our work is showing that they constitute points of vulnerability to therapeutic strategies. 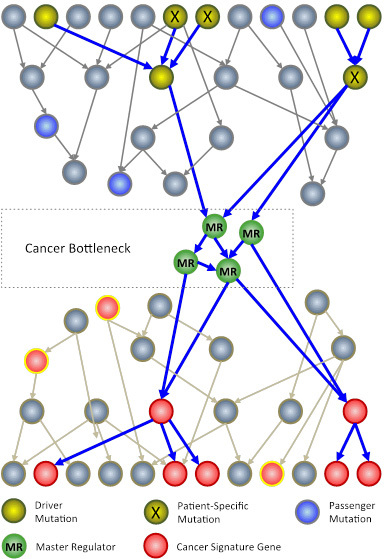 In addition, identifying tumor bottlenecks makes it possible to look upstream in the networks they define to identify the genetic factors that initiate network dysfunction in cancer. Such an approach dramatically narrows the number of possible somatic mutations that could possibly initiate disease, our work suggests, making the identification of driving mutations a much more tractable problem than is possible using only statistical approaches that do not contextualize mutations mechanistically within a network. Traditionally, cancer has been classified based on its organ of origin. Recent work in cancer genomics has revealed that even when found in the same organ, however, tumors can be highly diverse, and has been engaged in an ongoing project to classify tumors based on differences in gene expression between different subtypes. The problem with this approach, however, is that identifying differentially expressed genes does not clarify the factors that actually regulate tumor state and survival. Using the network-based framework described above, our lab is currently engaged in a project supported by the Leidos Biomedical Research (which operates the Frederick National Laboratory for Cancer Research) to re-classify tumors based on the tumor bottlenecks that define particular subtypes. By applying our computational methods to data contained in the Cancer Genome Atlas (TCGA), we are analyzing every sample in the database and categorizing it according to the master regulators that define it. Our approach is also incorporating proteomic data from the CPTAC Data Portal, which contains mass spectrometry measurements related to protein identity, protein abundance, and post-translational modifications that degrade or change its regulatory activity. This effort is revealing that master regulators appear to be present across multiple traditional cancer types. Moreover, the number of possible master regulators appears to be rather limited, suggesting that it may eventually become possible to condense the diversity of cancer phenotypes into a more limited number of subtypes defined by highly conserved programs. Our hope is that this knowledge could dramatically simplify the landscape of cancer and help to guide future cancer research. Tumor progression from a tractable form (e.g., pre-neoplastic lesions or in situ carcinoma) to an intractable, drug-resistant form represents perhaps the most formidable challenge both in terms of basic elucidation of tumor biology mechanisms and in terms of its translational and clinical implications. At issue clinically is the fact that although not all tumors will spontaneously progress to a metastatic drug-resistant stage, our ability to identify patients at greater risk of progression is still extremely limited. This failure is reflected in significant overtreatment of breast, lung, and prostate cancers, among others. Macroscopically, progression occurs either because pharmacologically actionable mechanisms have not been identified for a specific malignancy, or because drug resistance ensues due to genetic and epigenetic mechanisms. Microscopically, however, emergence of drug resistance is rooted in the exceedingly heterogeneous nature of cancer, both across individuals (inter-tumor) and, more importantly, across individual tumor cells (intra-tumor). With the support of an Outstanding Investigator Award from the National Cancer Institute, we are currently seeking to resolve this challenge by developing methods for defining the subclonal regulatory composition of tumors at the single-cell level. In this way, we are extending our network-based methodologies to study the impact of tumor heterogeneity on progression and drug resistance. We are focusing on three sources of heterogeneity: (a) genetically distinct tumor subclones, (b) epigenetically reprogrammed yet isogenic tumor sub-populations, and (c) normal cells (e.g. stromal or immune system related) whose presence modulates tumor cell behavior and response to therapeutic agents. Our hypothesis is that elucidating tumor-related mechanisms in single cells is critical to the development of better strategies for preventing and treating metastatic disease. The Cancer Target Discovery and Development initiative (CTD 2) is a multi-institutional, collaborative program of the National Cancer Institute whose goal is to leverage the huge amount of data that is now available about cancer to improve treatments for people with disease. This project is now possible by using large data sets such as The Cancer Genome Atlas (TCGA), Therapeutically Applicable Research to Generate Effective Treatments (TARGET), and the Cancer Genomic Characterization Initiative (CGCI), which contain pairs of molecular profiles of both cancer samples and normal tissues from which those samples developed. Using experimental techniques, high-throughput approaches, and bioinformatics methods, participating institutes are analyzing this information to define the molecular networks that underlie specific cancer subtypes, identify genes and pathways within those networks that hold potential as targets for therapies, and find small molecules able to perturb these targets in ways that can be used to prevent or treat disease. CTD2 funding is supporting a project in our laboratory to study the systems biology of tumor progression and drug resistance. We have developed a pipeline called Cancer Target High-Throughput Optimized Discovery and Evaluation (caTHODE), which uses both computational and experimental methods to efficiently discover and validate master regulators within the genomic networks that give rise to specific cancer subtypes. By determining the roles of master regulators of tumor progression and resistance to chemotherapy, this work is helping to generate a genome-wide, prioritized list of targets for further investigation. Rodriguez-Barrueco R, Yu J, Saucedo-Cuevas LP, Olivan M, Llobet-Navas D, Putcha P, Castro V, Murga-Penas EM, Collazo-Lorduy A, Castillo-Martin M, Alvarez M, Cordon-Cardo C, Kalinsky K, Maurer M, Califano A, Silva JM. Inhibition of the autocrine IL-6-JAK2-STAT3-calprotectin axis as targeted therapy for HR-/HER2+ breast cancers. Genes Dev. 2015 Aug 1;29(15):1631-48. Aytes A, Mitrofanova A, Lefebvre C, Alvarez MJ, Castillo-Martin M, Zheng T, Eastham JA, Gopalan A, Pienta KJ, Shen MM, Califano A, Abate-Shen C. Cross-species regulatory network analysis identifies a synergistic interaction between FOXM1 and CENPF that drives prostate cancer malignancy. Cancer Cell. 2014 May 12;25(5):638-51. Irshad S, Bansal M, Castillo-Martin M, Zheng T, Aytes A, Wenske S, Le Magnen C, Guarnieri P, Sumazin P, Benson MC, Shen MM, Califano A, Abate-Shen C. A molecular signature predictive of indolent prostate cancer. Sci Transl Med. 2013 Sep 11;5(202):202ra122. Wang ZA, Mitrofanova A, Bergren SK, Abate-Shen C, Cardiff RD, Califano A, Shen MM. Lineage analysis of basal epithelial cells reveals their unexpected plasticity and supports a cell-of-origin model for prostate cancer heterogeneity. Nat Cell Biol. 2013 Mar;15(3):274-83. Della Gatta G, Palomero T, Perez-Garcia A, Ambesi-Impiombato A, Bansal M, Carpenter ZW, De Keersmaecker K, Sole X, Xu L, Paietta E, Racevskis J, Wiernik PH, Rowe JM, Meijerink JP, Califano A, Ferrando AA. Reverse engineering of TLX oncogenic transcriptional networks identifies RUNX1 as tumor suppressor in T-ALL. Nat Med. 2012 Feb 26;18(3):436-40. Carro MS, Lim WK, Alvarez MJ, Bollo RJ, Zhao X, Snyder EY, Sulman EP, Anne SL, Doetsch F, Colman H, Lasorella A, Aldape K, Califano A, Iavarone A. The transcriptional network for mesenchymal transformation of brain tumours. Nature. 2010 Jan 21;463(7279):318-25.